Keegan Longueira’s biking expeditions began in December 2011 when he used his year-end university holiday to cycle from his home in Witbank to Cape Town, a journey that took him 22 days. He repeated the 1,800-kilometre ride the next year but with only two weeks available, he put in more mileage each day and wrapped up the journey in 10 days. And he did it again in December 2013 – meandering route that took him 14 days. And then… Keegan announced his new project: a biking expedition from Cairo to Cape Town, which he began on 2 January this year. He was chasing Robert Knoll’s World Record of 70 days. From early on, Keegan was plagued by injury and skin infections and by the time he reached Sudan, it looked like his record opportunity was lost. Four-days behind record pace, he cut out planned rest days to make up distance. He crossed Sudan, Ethiopia, Kenya, Tanzania, Zambia and Botswana before eventually arriving back in South Africa. 59 days, 8 hours and 30 minutes after setting off from Cairo, Keegan reached Cape Town and clocked a new World Record time. 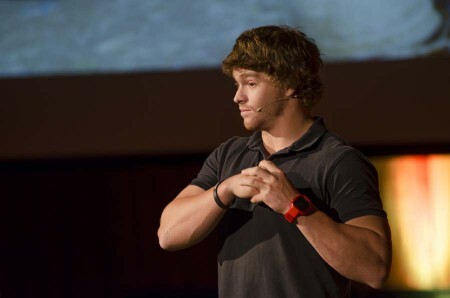 At FEAT Kids and FEAT (Jo’burg, 8 October 2015) Keegan speaks to us about this expedition, focusing on his two favourite countries – Sudan and Ethiopia.